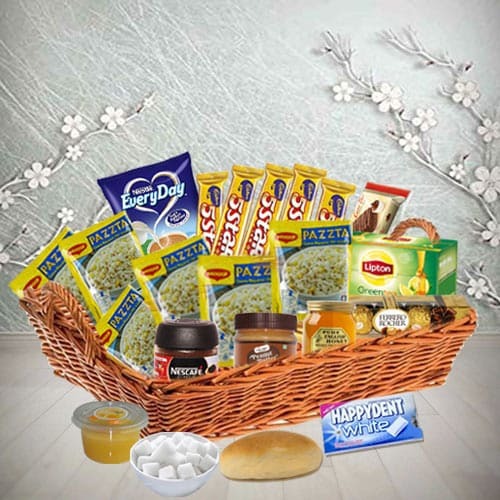 Order for delivery of Happy Afternoon English Lunch Hamper to your special one. When you want to send the gift of excellence, this Basket will surely leave a lasting impression. It includes Maggie Maccaroni (Three Pcs. ), Sweet Bun, Corrisant Swiss Roll, Amul Peanut Butter, Honey, Cup Pudding, Green Tea Pouches, Coffee Bottle, Maggie Pasta (Three Pcs. ), Sugar Cubes, Milk Powder, Ferrero Rocher (Five Pcs. ), Cadbury Dairy Milk, Five Star (Five Pcs.) and Happy dent Chewing Gum.